With the limited edition PRIVIA PX-3BK stage piano, CASIO has created a fantastic gift in its anniversary year for all live musicians. The PRIVIA PX-330, which forms the basis of the new limited edition piano, is taken to the next level for the stage. High-performance master keyboard functionality turns the piano into a controller. Editable DSP effects, tone editor and new tones expand its capabilities on stage and in the studio. On top of this, the 4-band equalizer enables a wide range of tone settings. 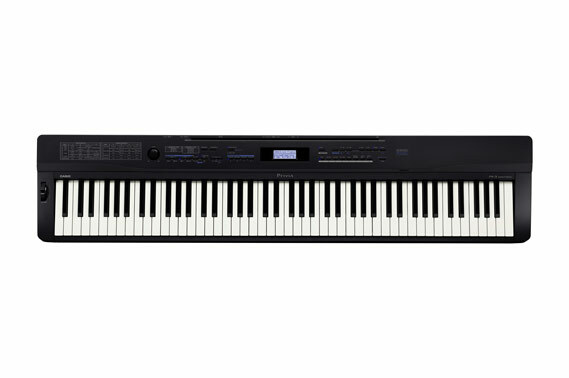 The special feature of this talent-packed piano from CASIO is its weight: since the PX-3BK was designed as a stage model without speakers, it is now extremely light at less than 11 kilos! The excellent AiF Sound source produces 250 top-quality tones, which truly come into their own in both classic piano repertoire and many other genres. The innovative AiF Sound Source technology produces top-quality tones perfectly suited to both classical piano music and other genres and enables gentle transitions between individual samples and dynamic levels. Complex stereo recordings from a top-quality concert piano (samples) with four dynamic levels provide a particularly authentic sound and allow you to play across various intermediate stages from piano to forte without any sound discolouration or audible leaps. Guarantee an absolutely first-class piano sound. The expansion of the range of voices has made interpreting complex works a true pleasure and lets you play sweeping chords and make extensive use of the damper pedal. Piano feeling: The scaled hammer-action keyboard with 88 touch response, weighted keys is based on the keyboard of a concert piano and provides an authentic playing experience. A third sensor in the keyboard allows players to use particularly fast techniques without the notes sounding unnaturally cut off. Faster access: You can file up to 96 set-ups (8 x 8 spaces) in the registration memory. The PX-3BK digitally reproduces the high-quality sound of a top concert grand piano complete with first-class reverb effects. The simulation of the resonating strings that is provided by the "Acoustic Resonance" CASIO effect rounds the sound experience off perfectly. The scaled hammer-action with 88 touch response weighted keys are based on the grand piano keyboard and make for an authentic playing feel. Both an audible and visual delight: The refined, matt keys with ivory touch not only look sophisticated and high quality, but provide a comfortable playing surface and additional stability to prevent your fingers from sliding. Enjoy a realistic playing experience! The Stereo LINE IN / OUT of your digital piano provides a connection for full sound experiences. e.g. to your hi-fi or PA-system. The proven interface for electronic musical instruments, additional equipment and computers simplifies data exchange for you. Duet delight: two headphone connections are available. A pedal without expanded damper capability is included in the scope of delivery. The SP-32 3-pedal unit with expanded damper capability is available as an optional extra. The innovative SD memory medium offers a simple but limitless way to expand the internal memory of the PX-3BK. Playing aids such as the pitch bend wheel enable you to temporarily change the pitch of played notes, to authentically reproduce guitar or saxophone playing techniques. The USB/MIDI­(GM) connection enables further Midfile songs to be loaded into the internal memory. No software installation from a CD-ROM required thanks to Plug & Play and the USB driver is compatible with both Mac and Windows (from Mac OSX 10.03 and Windows XP/Vista).